Jatayu earth’s center is located at a small village called Chadayamangalam in Kollam (Quilon) District is one among the most awaited viable tourism destinations in Kerala. This is the first cooperative work by the Tourism Department of Kerala and Mr. Rajiv Anchal (who is the mastermind and promoter) accompanied by private valuation holders to make destination, which is an inimitable blend of all features of tourism including adventure, mythology, history, nature and beauty in the serenity. Its assumed that this is the place where – Jatayu, a demi-god of Hindu epic “Ramayana” having the form of a vulture, fought with Ravana – multi headed demon king of Lanka (now Sri Lanka) to prevent kidnapping of Goddess Sita, and got slain off one of his wing. It is believed that Jatayu fell somewhere near the tiny Kerala village named Chadayamangalam. The statue of Jatayu is a giant sculptor idolizing this lesser known warrior who fought and lost his life in his attempt to preserve righteousness. Why Named As Jatayu Earth’s Center? Jatayu is considered as the personification of Courage and Loyalty. Endangering his life, he attempted his best to save Goddess Sita from her kidnapper. Therefore, the Jatayu statue stands as a soaring honor to women’s security and uprightness. Jatayu also signifies a former age when human beings, animals, birds and other living forms were concerned for each other and survived peaceably on this Earth. Every visitor at Jatayu Earth’s Center is entreated to comprehend and outdo the inner meaning of this inspirational design. 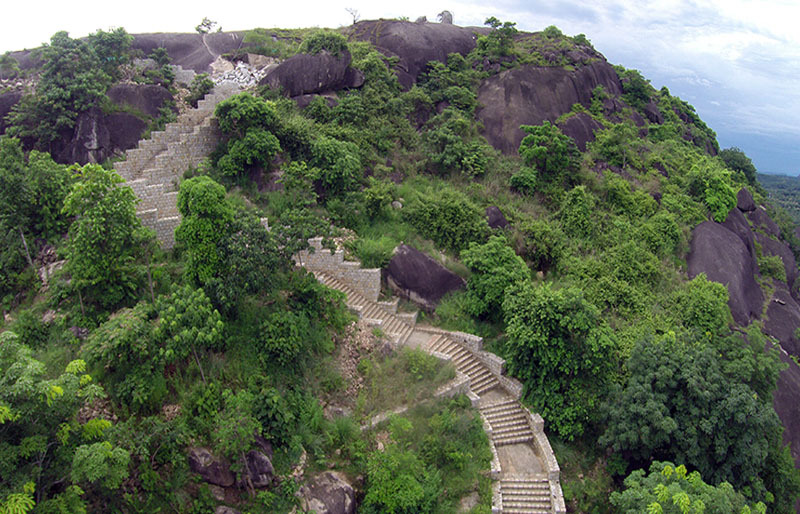 Jatayu Earth Center includes 4 hills considered to be developed for tourism. 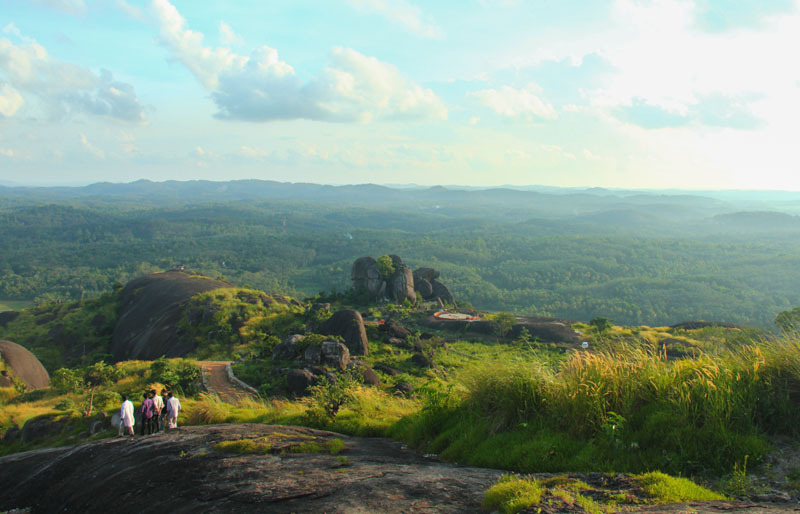 This includes Jatayu Rock Hill, Adventure Rock Hill, Elephant Rock Hill and Kitchen rock Hill. Each hill has its own importance. As of now only two ie Jatayu rock hill and Adventure rock hill are fully developed for tourism purpose. Chadayamangalam where Jatayupara is located is accessible from majore cities and tourism destinations of Kerala. Below are the details how one can reach to this place. Kottarakara rly station is the nearest and easily accessible which is 22kms and it may take 30mins by road. Quilon (Kollam) rly station is the nearest rly station which is 43kms and it may take an hour by road to reach. Trivandrum Rly statin – 52kms ; Aluva Railway Station (before Ernakulam Railway Station), Coimbatore Railway Station and Madurai Railway Station. Trivandrum is the nearest airport which is 52kms and may take an hour to reach the place by road. Jatayupara is located approx 200mtrs from Trivandrum – Kochi highway. As mentioned earlier, Jatayu Earth Center is consisting of 4 hills and at present only Jatayu rock hill and adventure rock hill is open for tourists. Tourists who are interested to visit only the Jatayu statue, audio visual museum and mini theatre, half day is more than enough provided cable car service is booked online in advance. Adventure rock hill is having different adventure activities and it takes a full day for the same. Tourist, who does not want to experience any adventure activities, is advised not to spend time for this. Jatayu earth Center is having a separate package for adventure activities which start from morning and ends at evening along with lunch and evening refreshments included. In case tourist want to visit both ie Jatayu rock hill and adventure rock hill should ensure that they start adventure activities early and after this Jatayu rock hill is visited around 4pm. Most of the tourist who is coming to visit Kerala is arriving and start their tour from Kochi covering tourist destinations like Munnar, Thekkedy, Alleppey, Kovalam, Trivandrum and finally either going back from Trivandrum or Kochi. Chadayamangalam is located in between Alleppey and Kovalam /Trivandrum on the MC road side and it’s easy for them to visit the statue. Those tourist who are not visiting Kovalam/Trivandrum, but going back after Alleppey, its easy for them to visit this as it take 2hrs drive from Alleppey to reach Chadayamangalam. Having said that, visiting Chadayamangalam or including Chadayamangalm in the tour package is easy and one should visit this architecture.